The two most eminent American educators represented in the Newsam Library are John Dewey (1859-1952) and Jerome Bruner (b. 1915 – ) Both men had a profound influence on British education and both authors represent 20th century experimentation in education. We celebrated Bruner’s 100th birthday last month and I wrote about his contribution to the development of curriculum theory in reference to the social studies curriculum MACOS (see: http://libguides.ioe.ac.uk/macos) in my last post here. This post highlights some of the other ‘Americana’ in the UCL Institute of Education Library’s Special Collections. John Dewey was a philosopher, psychologist, educational reformer and an outspoken liberalist. His School and Society: being three lectures supplemented by a statement of the University Elementary School published in 1899 set out his educational theories and philosophies. He linked education to critical thought particularly in reference to social reform, democracy and civil society. 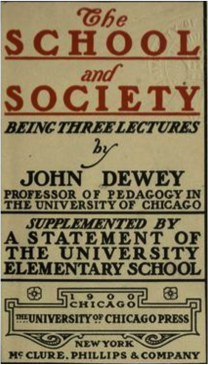 Dewey believed that the role of education was to develop moral and critical individuals who had the necessary skills, attitudes and aptitudes to solve problems in society without being indoctrinated by the political machine of the day. He encouraged the students in his experimental schools to develop “free personalities” so that their individualities shone. His other writings include Moral Principles in Education (1909), Interest and Effort in Education (1913) and Democracy and Education (1916). An American from an earlier period, who paved the way for free education, free libraries and teacher-training colleges was Horace Mann (1796-1859). He believed that a literate and educated public would safeguard the future of the state. Mann is best known as the “Father of the Common School Movement” – the equivalent of state schools in the UK. His National Education is held in the History of Education Collection. Mann was a member of the Massachusetts Board of Education and used his office to argue that universal education that was funded by the tax paper was the way forward in ensuring that the young would metamorphosis into disciplined, judicious citizens. Although based in Massachusetts, Mann’s ideas were taken up by other states in the US. In addition to the above, there are a large number of 18th and 19th century texts representing American education at all educational levels. For example, Francis Wayland’s (1796-1865) Introductory discourse (1832) on pedagogy delivered before the American Institute of Instruction is an important work as it reflects Wayland’s educational philosophy. He was an advocate of anti-slavery causes and in his honour had named after him the Wayland Seminary that was established to educate former slaves. He was also in favour of public libraries and was an important figure in Massachusetts for enabling the establishment of state-funded libraries. Early feminism is represented by Anna Brackett’s (1836-1911) book on The Education of American Girls (1874) – a response to arguments against the co-education of males and females. Brackett was a female philosopher, feminist and educator and was an important educator among women. She believed that there were two steps to the learning process – the “perceptive stage” and the “conceptual stage” and no girl could succeed in life without achieving both. If girls remained uneducated in both stages, they would not be able to think abstractly. Further, as a feminist, she believed that if they remained in the home, they would be morally and intellectually underdeveloped, unable to function in society or to participate in public affairs. Women confined to their homes would also be vulnerable to exploitation by men. Thus, Brackett emphasised the importance of co-education. Then there are oddities such as William Godwin’s (1756-1836) 1797 open letter to a young American on the course of studies it might be most advantageous for him to pursue. This provides evidence of moral values, social class and is a source for the study of literary history. Godwin was the husband of Mary Wollstonecraft, philosopher and advocate of women’s rights and father of the English novelist Mary Wollstonecraft Shelley. The American Institute of Instruction is also represented by two publications in this collection of educational Americana as is the American Asylum, at Hartford, for the Education and Instruction of the Deaf and Dumb. Other works by English authors on the American system include Catherine Dodd’s The ideals of the American school-girl (1901), The evolution of the American university (1901) by the American scientist and chemist, F. W. Clarke (1847-1931) who was commissioned by the government of the day to undertake a study of the teaching of science. Lastly, but not least, the Comparative Education Collection holds many materials relating American education from the early 1930s onwards. Historically, the Institute of Education has been one of the leading centres of comparative and international education research. The Library of the department researching in this area was set up by one of the Institute’s directors, Sir Percy Nunn (1870-1944) in the early 1930s and in 1935 it benefitted from a generous grant given to the Institute by the Carnegie Corporation of New York. This entry was posted in Special Collections and tagged American education, Comparative Education, Francis Wayland, History Libraries Research Open Day, history of education in America, Horace Mann, Jerome S. Bruner, John Dewey, MACOS, rare books, William Godwin. Bookmark the permalink.